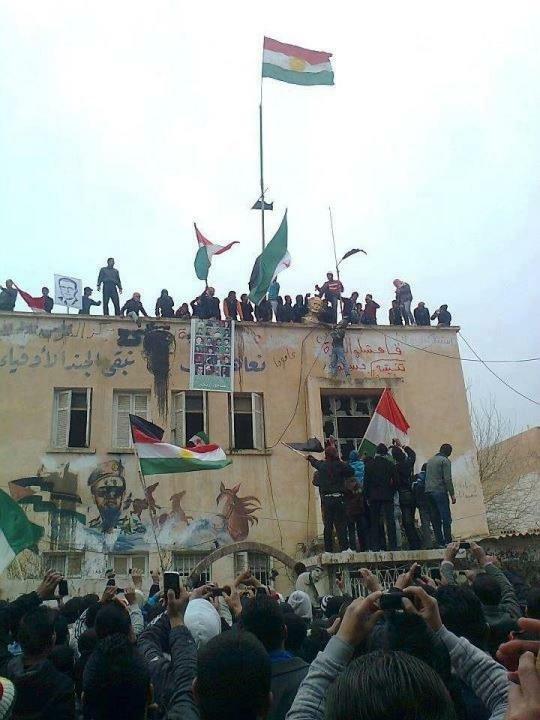 The flag of Kurdistan is draped over the walls of public buildings in Afrin in northern Syria: After the security forces left the small town near the Turkish border two weeks ago, the Syrian banners have all but disappeared. Instead, new colours have been raised, not only the Kurdish national colours, but also those of the Democratic Union Party (PYD), the Syrian wing of the Kurdistan Workers Party (PKK), deemed a “terrorist” organization by many countries because of its bloody fight for separation or at least autonomy from Turkey for 30 years. Afrin is not the only town which has been effectively taken over by Kurdish militia after the regular Syrian troops pulled out, Syrian and Kurdish activists say. The same has been reported in Kobani, also in Aleppo Province, as well as in Amude and Deirik in eastern Syria. The Kurds, roughly 10 percent of the population, have long stayed on the sidelines of the Syrian uprising, with the Kurdistan region of Syria remaining relatively peaceful. But now, with the PYD asserting its power in the north, the minority group risks getting caught up in conflict, as foreign interests intersect with local rivalries. Domiz refugee camp, in the semi-autonomous Kurdish region of northern Iraq, some 60km from the Syrian border, is home to nearly 2,500 Kurdish Syrians who have fled the violence in Syria in the past few months. (Thousands of others have settled outside the camp in other parts of Iraqi Kurdistan). Nearly one-quarter of the camp’s residents are young single men. During a recent IRIN visit, rowdy youth wearing underwear and tracksuit bottoms complained of the excruciating heat and lack of job opportunities. At first, they were reluctant to admit to any training, some trying to silence others willing to speak. “When the regime falls,” another insisted. “No, tomorrow!” the first youth said. “We’re taking this training to go back and fight Assad,” a third interjected. These are among hundreds of Syrian Kurds that have been receiving military training from the Kurdistan Regional Government (KRG) of Iraq since the beginning of the conflict in Syria, “so that they can play a role,” according to Minister Falah Mustafa, head of the KRG’s department of foreign relations. Estimates of the numbers trained range from 600 to 2,000, but Cale Salih, an analyst with the International Crisis Group (ICG), told IRIN about 650 appear to be ready to return to Syria to fight. The aid worker at Domiz said some youth had left the refugee camp after receiving some training, suggesting they may have returned to Syria to fight. Analysts say it is part of an attempt by KRG President Masoud Barzani to extend his influence in Syria, but could also create divisions: Once armed, these Barzani-loyal Kurds could clash with forces of the PYD, until now, the only armed Kurdish group. The PKK’s struggle with Turkey has put it at odds with Barzani, who has cultivated his ties with Turkey, one of KRG’s main trading partners. According to Kurdish sources, the training was coordinated with the Kurdish National Council (KNC) - a new Kurdish umbrella group, created in the wake of the Syrian uprising and based in the Kurdish Syrian town of Qamishli. KNC’s close ties with Barzani and its move towards militarization are likely to exacerbate its rivalry with the PYD. Analysts say Barzani’s target in training these forces was not Assad, but the PYD. But until now, the Kurds have not firmly positioned themselves as part of the so-called revolution. Indeed, they could end up fighting against other opposition forces for control of territory. Take the strategic town of Qamishli, rich in oil and gas reserves, and in symbolism: it was home to a brutal crackdown by the regime in 2004. The PYD has traditionally been weaker in Qamishli, where analysts say all parties - the PYD; the Kurds who support Barzani and the KNC; the rebel Free Syrian Army (FSA); and the Syrian government - could end up vying for power. And while the Kurdish fight may seem like a side show, what happens in Syrian Kurdistan is “extremely decisive” for the future of Syria in the scenario of a civil war, Salih said, because it will determine the positions of Turkey and of Iraqi Kurdistan in those areas, and will determine the future of the PKK movement as a whole. The so-called Kurdish uprising is not yet well-understood, with conflicting explanations as to how the PYD came to control parts of northeastern Syria. Sometime after the Syrian uprising in March 2011, the Syrian government allowed the PYD to return hundreds, possibly thousands of its members - estimates range from 1,000 to 2,000 - to Syria from its headquarters in the Qandil mountains, along the Iraq-Iran border. The PYD slowly began taking control of some areas of Syrian Kurdistan, setting up checkpoints and municipal councils - known as the People’s Council of Western Kurdistan (PCWK) - without too much interference by the government. In July, PYD control was solidified. Some say the regime practically handed over the towns to the PYD. Others say it was given a deadline to leave by the PYD, and did not have the means to fight back. Activists like Iso welcome the takeover as “liberation” from decades of deprivation of many basic civil rights by Damascus. But for now, the PYD’s resurgence remains young and its popularity hard to gauge, especially as other new umbrella groups like the KNC enter the fray. What appears certain is that the PYD is eager to fill the power vacuum left by the state. But the party does not rely only on military power to increase its influence, according to Siamend Hajo, of the website Kurdwatch in Berlin, which tracks human rights violations against the Syrian Kurds. "Many Kurdish nationalists don’t have a problem with what is happening because now Kurds are ruling Kurds…But at the same time, one dictatorship is replaced by another"
After decades of cultural repression, the PYD - with some degree of allowance by the government - has opened schools teaching the Kurdish language, and cultural centres have mushroomed in the region. In recent months, observers say, the PYD’s relationship with the Syrian government began to change. While there might have been an alliance between them in the early stages of the revolt, the PYD has now “seen the writing on the wall”, breaking off the presumed cooperation and pursuing its own agenda instead. While independent protests have hardly taken place in PYD-strongholds like Kobani, Amude and Deirik in recent weeks, amateur footage on the internet shows PYD rallies, with crowds chanting anti-regime slogans. According to Salih, PYD and regime security forces have also clashed. “[The PYD] is an impressively disciplined and effective group, but totally committed to its own agenda, and absolutely ruthless in carrying it out, ” writes Aron Lund, author of a detailed report on the Syrian opposition. Nor is the Kurdish leadership convinced that jumping in bed with the Syrian opposition is in their best interests. Many Kurds suspect the rebels do not respect the rights of the Kurds any more than the Syrian regime. For the Kurds, their own rights come first, before any discussion of democracy or transition. For KRG’s Mustafa, it is important the Kurds position themselves now - before the fall of the regime. Recently the structures of an autonomous Kurdish region in northern Syria seemed to be starting to take shape. A regional Kurdish government was formed in Qamishli, and a local parliament elected. Two weeks ago, KRG brokered an agreement between the KNC and PYD to cooperate, raising hopes that conflict could be overcome. But the Kurds remain divided. And too close a relationship with the PYD would put Barzani, a Turkish ally and KNC supporter, in an awkward position. Formally, all Kurdish armed groups are part of the “People’s Defence Unit” (YPG) which is supposed to answer to the KNC as well as the PCWK. But, most fighters are PYD members, and Kurdish activists say its military superiority allows it to marginalize other political parties. In cities like Qamishli and Hassake, where the PYD is less popular and the Syrian security forces are still present, each Kurdish faction organizes its own weekly rally. If it comes down to a power struggle, analysts say the PYD is likely to win. “Funding or support from northern Iraq may help other factions preserve some leverage vis-à-vis the PYD, but I can’t see that it would tip the scales,” Lund says. But regional players are not likely to stand on the sidelines. “We will not follow the situation blind-folded,” Mustafa of KRG said. Turkish Prime Minister Recep Tayyip Erdogan said last week that PKK activity in Syria could give Turkey grounds for intervention. The PKK earlier threated to turn the whole cross-border Kurdistan region into a “warzone” if Turkey intervened in Syria. Until now, the PYD’s control has been largely unchecked because they are virtually the only armed group on the ground, as the Kurds have managed to keep the FSA out of the region. 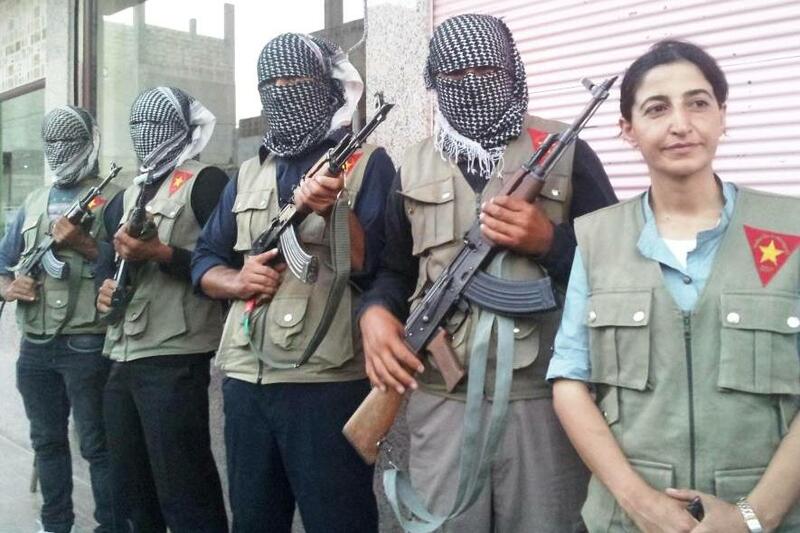 Small Kurdish battalions in the FSA - there are only one or two - are reportedly trying to stay out of the PYD’s way. While some Kurdish activists fear that the return of the fighters from Iraq will trigger internal fighting, others hope they will help create more of an equilibrium.